Looks like framework of some sort, well the shadow of it anyway. Is it a Ferris Wheel? 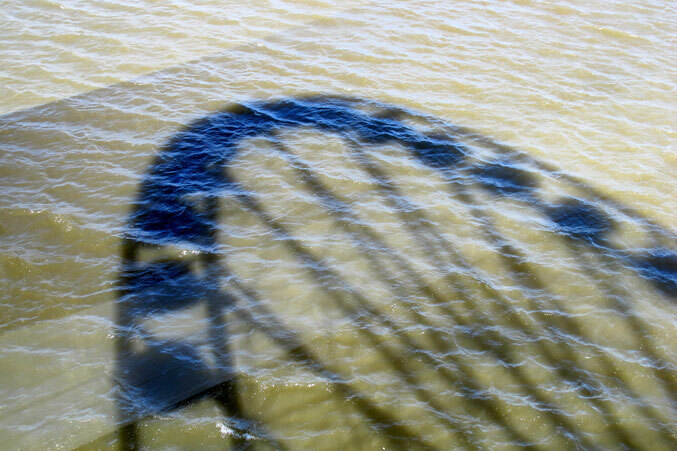 I'm pretty sure its the shadow of a ferris wheel reflecting on the water. Thanks to all three and especially - thatoneguy - the game is over. Yes - it is an unexpected shadow cast on the Potomac River through a Ferris wheel on its very first day of being open to the public. I had the pleasure of watching this wonderful ride being built then grabbed a ride on this special day. I could not get enough of this shadow and will post a story on the ride very soon. If you have a chance to visit - this ride at National Harbor is a joy. Thanks and regards to all. Which Tree Lost Its Leaves Last?